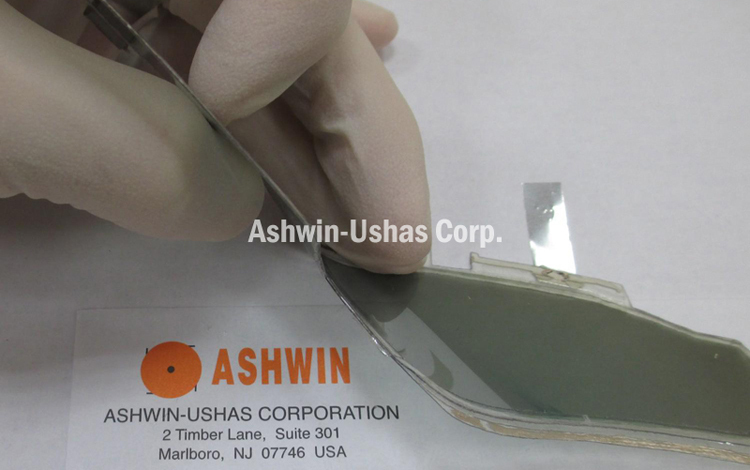 Electrochromic Sunglasses & Goggles | Cutting Edge Technology | Ashwin-Ushas Corp. | Ashwin-Ushas Corp.
FADES auto-darkening eyewear on sale soon. Have you seen photochromic sunglasses worn by many people with prescriptions, which automatically darken when going outdoors, and always wondered why they couldn’t switch much faster, give more varied shades of darkness, also work indoors and inside automobiles, and be available as just regular, fashionable sunglasses without prescriptions? 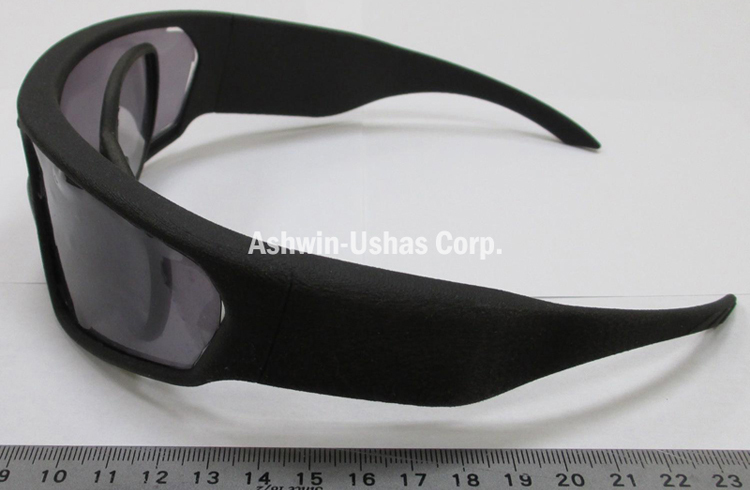 Well, such a product, in the form of Ashwin electrochromic sunglasses and goggles, is finally here and will shortly be available commercially. Ashwin electrochromic sunglasses and goggles automatically switch to different shades of darkness in response to ambient light in less than 2 seconds. They have appealing shades of color (transparent to light gray to blue-gray to dark blue-black). They work indoors and in automobiles and are very lightweight. They need to be recharged only after three or more days of heavy use (much less than your cell phone). And they’re much, much less expensive than photochromics. They’re perfect for that hike in the woods on a sunny day, with the sun alternating between peeking brightly through the leaves or being heavily shaded by them. They’re also perfect for the construction worker going rapidly in and out of very dark and light areas while working on a skyscraper 20 floors above the street. They’re also available with prescription inserts, for those having prescriptions. 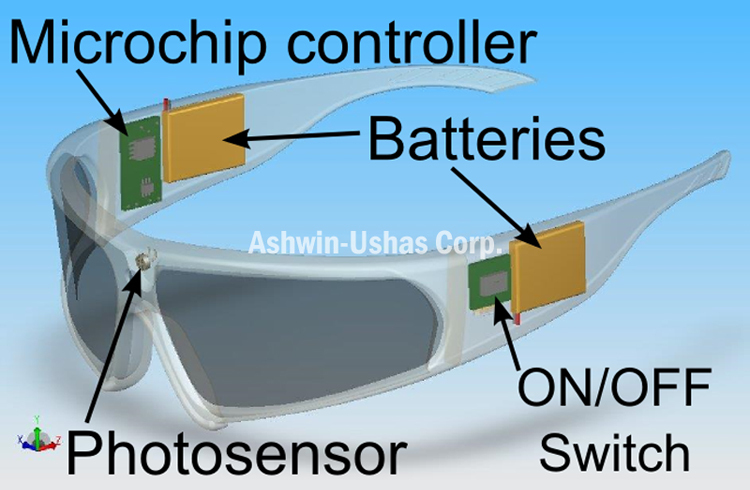 Ashwin electrochromic sunglasses prototype, auto-switching while going from indoors to outdoors. 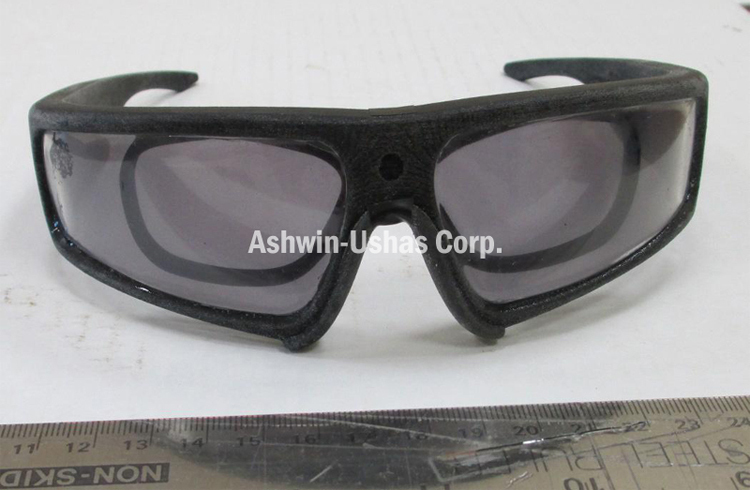 Ashwin electrochromic sunglasses (industrial/medical safety version), auto-switching while going from indoors to outdoors and back. 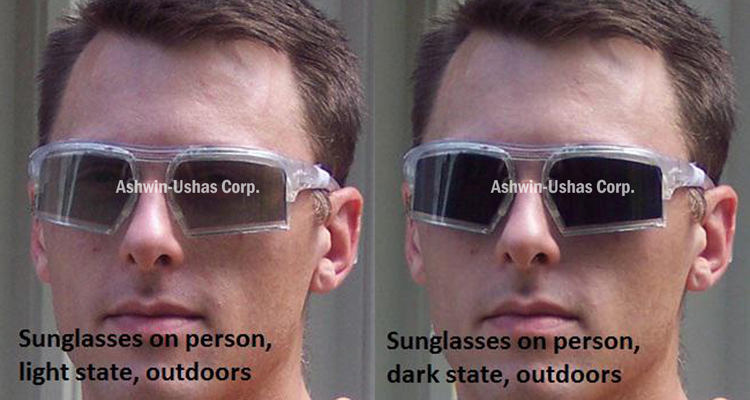 Ashwin electrochromic sunglasses prototype, auto-switching while going from indoors to outdoors; winter snow and sun. Electrochromic, changing color (lightening or darkening) with a small, applied DC voltage supplied via a rechargeable Li battery. So they work indoors and in automobiles, unlike photochromics, which need UV light for activation. 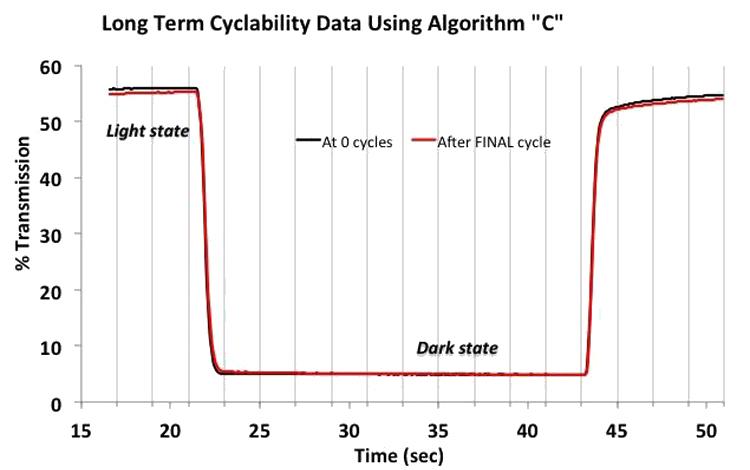 Automatically adjust to the brightness of the ambient light with continuously varying shades of darkness: Activated by photosensor interfaced to sophisticated Microcontroller. Have appealing shades of color (transparent to light gray to blue-gray to dark blue-black). Switch rapidly: Dark to light almost instantaneously (less than 1 second). Light to dark in less than 2 seconds. Compare with photochromics (15 seconds to several minutes). 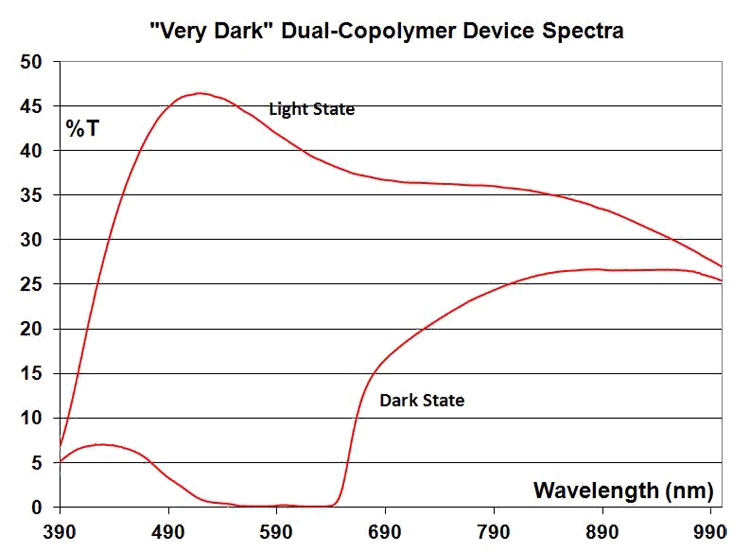 Have the highest known light/dark contrast and fastest switching time of any electrochromic materials to date. Need to be recharged only after three or more days of heavy use (much less than your cell phone). 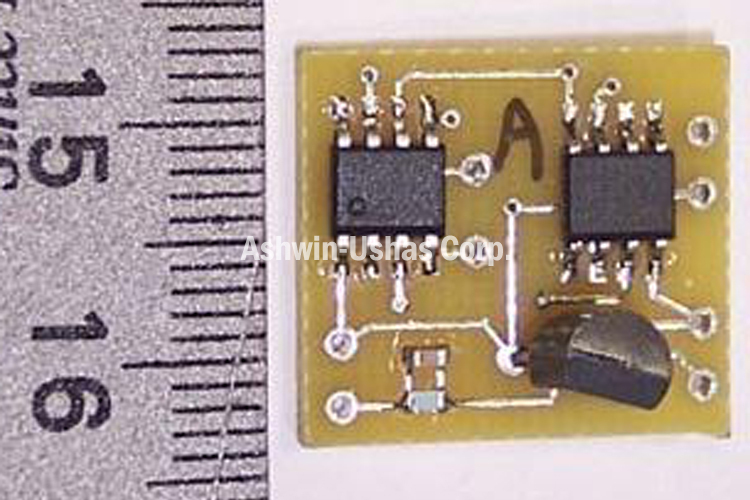 Have a sophisticated Microcontroller and rechargeable battery built invisibly and seamlessly into the glasses or goggles frame. 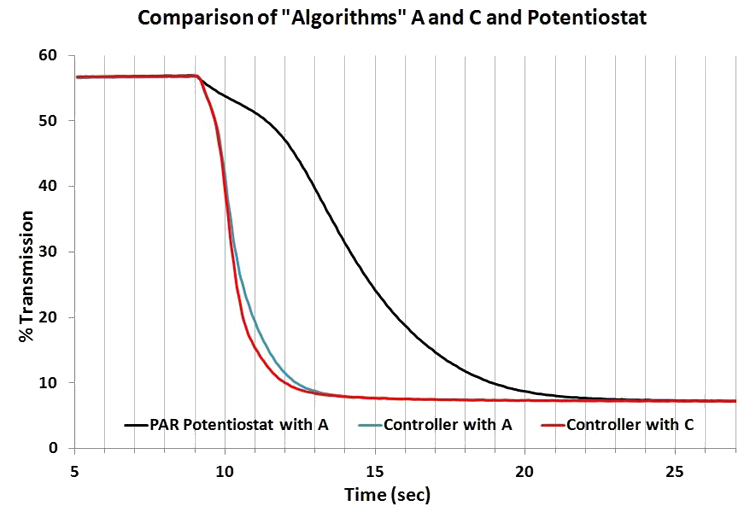 Are based on patented electrochromic Conducting Polymer and control algorithm technologies. Accommodate prescription lens inserts, for those having eye prescriptions. The safety version of the glasses and goggles are compliant with ANSI Z87.1 (an industrial safety standard) and GL-PD 10-12 (a US military standard). 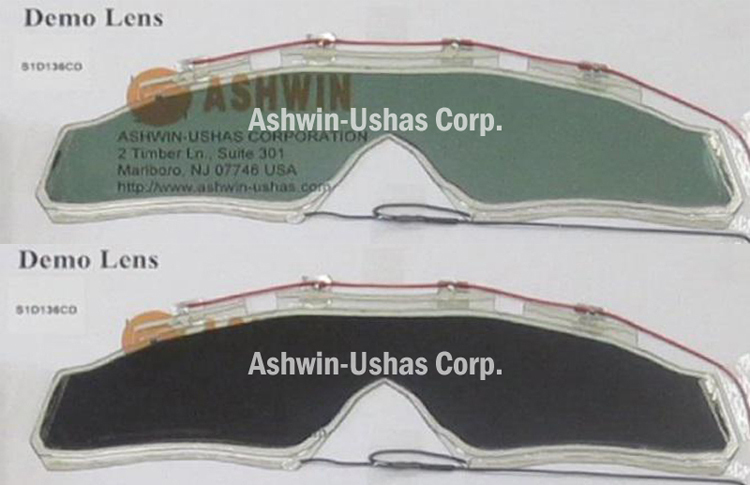 Ballistic test of Ashwin electrochromic goggles prototype, showing conformity with MIL-PRF-32432 specifications. Note that these %Transmission values are measured against air reference, i.e. 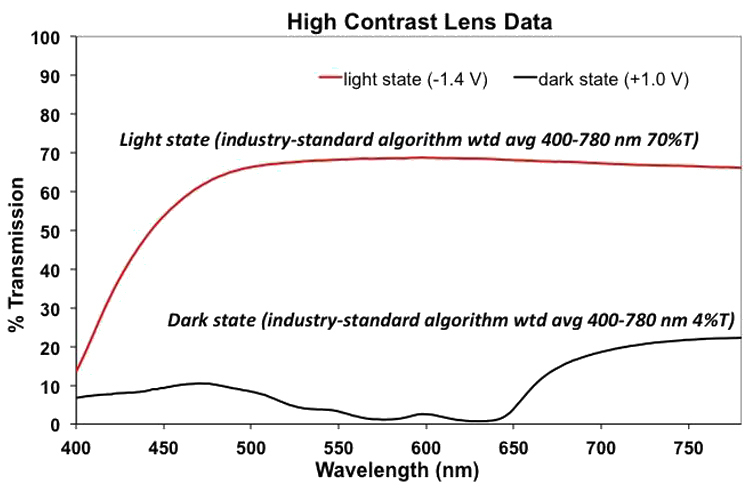 they are real-life, unlike many values reported in the literature, which are against substrate reference and thus show light-state %Transmission values of 90% or higher, whereas even clear window glass has a %Transmission of only about 87%. 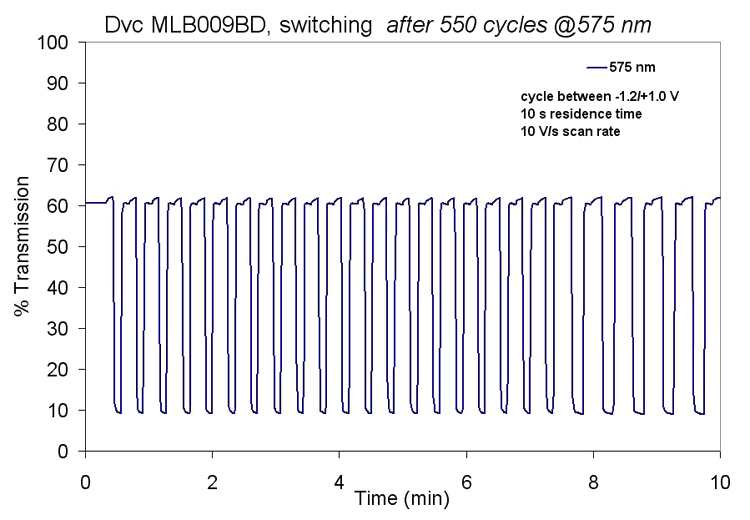 Switching sunglasses based on LCDs (liquid crystal displays) switch very rapidly (nearly instantaneously). However, these are more like shutters (not electrochromics), and nearly all have only an extreme-dark and extreme-light state, with no provision for states of intermediate darkness. They are also naturally polarized (so you can’t see that automobile display through them) and are bulky or heavy. Metal-oxide (e.g. 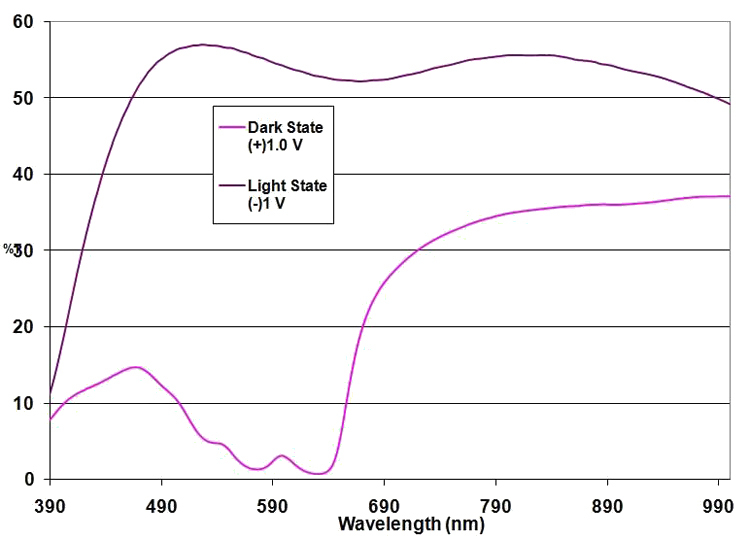 WO3) based electrochromics have poor stability, comparatively poor light/dark contrast, are bulky, and have high cost. 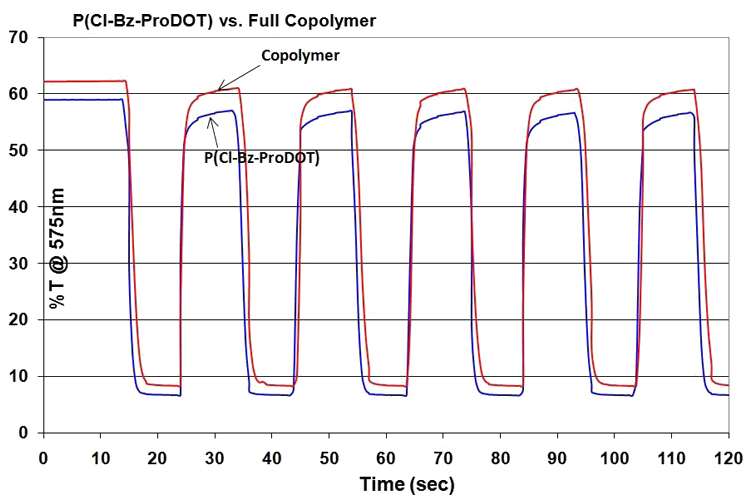 Other Conducting Polymer based electrochromics, including dual-polymer based ones, have much poorer performance. They also have high Haze and other undesirable qualities. Are also available as appliqués (films) that can be applied to any surface with pressure-sensitive adhesive, useful for application to larger areas. For more detail on this feature, Contact Us. 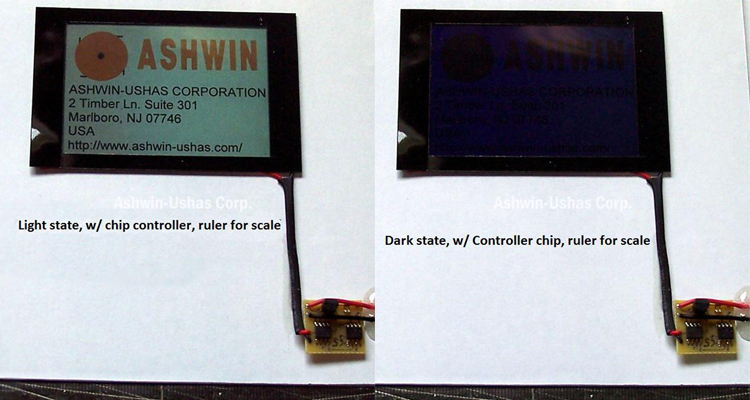 Typical extreme-light/extreme-dark contrast, with Microcontroller also shown. Safety sunglasses prototype with prescription insert: Typical light/dark contrast. 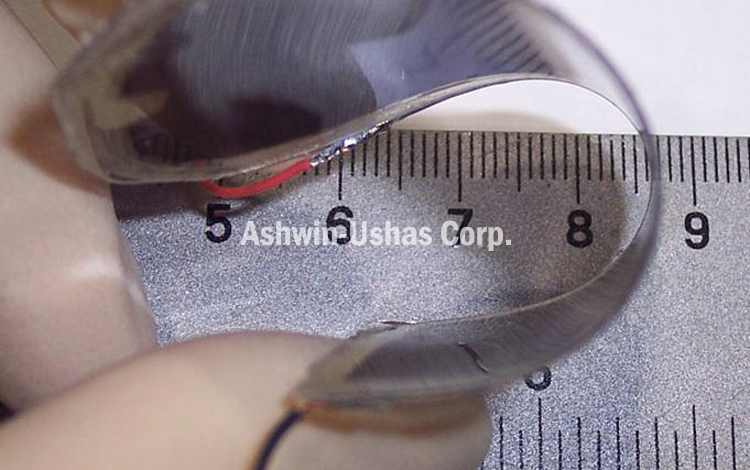 Example of exceptional flexibility, durability and thinness of electrochromic lens. Note: Spectra shown are actual data, against air reference, rather than against substrate, as reported by most researchers in the field. For reference note that even clear window glass will have flat Transmission at about 87%. 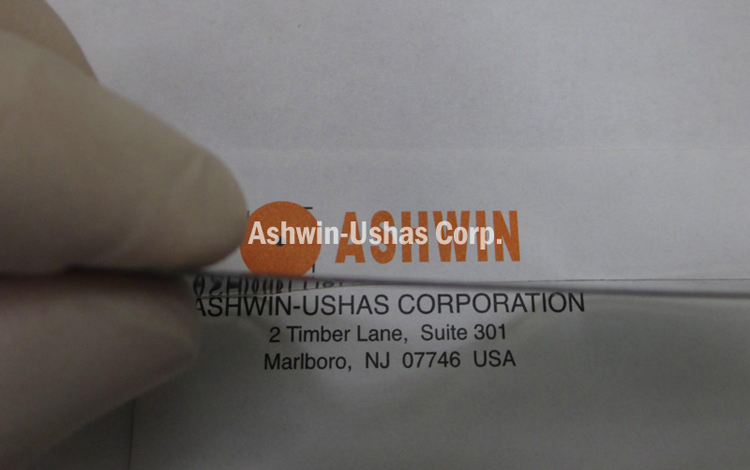 Expected to be offered for sale in the very near future by our affiliate company, AshChrom. For inquiries and more information, please Contact Us.